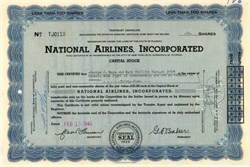 Early Engraved SCARCE Certificate from National Airlines, Inc issued in 1945 prior to the end of WWll. This historic document was printed by the Columbian Banknote Company and has an ornate border around it with the company's name on top center. This item has the printed signatures of the company's officers, including George Baker as President, and is over 57 years old. This is the first time we have offered this for sale.